Everything's That's Underneath is the debut short story collection from Kristi DeMeester, and about time too. For years she has been gracing the pages of all the top horror magazines such as Black Static, Apex, Shimmer, Jamais Vu, Nightscript, Lamplight, Shock Totem, Gamut Three Lobed Burning Eye and many, many more. "There's so much more. Underneath our skin. Living and breathing and drinking what it can. Waiting to be born. Waiting for us to gobble it up." I would describe this as quiet unsettling, sometimes beautiful horror that is very skillfully executed. These are stories about dark desires, of broken people and relationships. In this book you enter a dark world of seeing everything that is beneath the cheery constructed veneer of our society. In these tales you'll come across broken people with broken dreams trying to gravitate towards a brighter future. Kristi DeMeester has a great style of writing, her stories are really intriguing and mysterious remaining so long after you have read them. She certainly keeps you in the dark with her tales, she'll show you what's going on, but you'll never really let in and given an explanation, you're merely an onlooker which heightens the unease and terror. She has a magical ability to make the unreal seem very real. This is a really astonishing collection, I truly loved each tale in this collection but for me Daughters of Hecate was my personal favourite, it's the scariest thing I've read in a long time! I also really enjoyed the novelette Birthright too. This is an author I'm going to keep a close eye on for she is an author clearly on the rise! Thanks so much for Apex for giving me a free copy in exchange for a honest unbiased review! 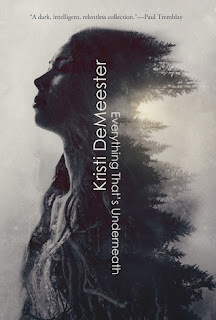 Kristi DeMeester is the author of Beneath, a novel published by Word Horde, and the author of Everything That's Underneath, a short fiction collection published by Apex Publications. 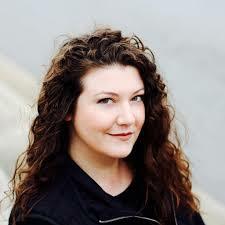 Her short fiction has appeared in publications such as Ellen Datlow's The Best Horror of the Year Volume 9, Year's Best Weird Fiction Volumes 1 and 3, Black Static, The Dark, Apex Magazine, and several others. She has finished her second novel and is currently at work on her third.